Upgrading Your Team to Outlook 2007? In conjunction with today’s formal launch of the 2007 Microsoft Office system, we’re rolling out a limited-time offer that should be attractive to those of you who are upgrading your team to Outlook 2007. Thoughout the month of February we will provide a 25% discount off all group license purchases of 25 or more copies of ClearContext IMS Professional for companies that are upgrading to Outlook 2007. If interested, drop a line to sales at clearcontext dot com for more detail. Posted by brad at 6:50 pm on January 30th, 2007. This is one of those features that should have been Outlook from the beginning, making it extremely easy to find the message you are looking for just by typing in a few keywords. Sure, you can download any one of a number of free desktop search applications that provide this functionality; but the integrated search is easy to use and provides results right within the Outlook interface. Think of the millions of hours that will be saved by average workers when they start using this feature. It’s easily the single biggest time saver in the new release. Hiding the folder list and other navigation elements on the left hand side of the Outlook interface opens up a good deal more space for the preview pane, which in turn ensures that I rarely have to open a message to read or act on it. If I need to open a folder, I can temporarily expand the navigation pane by clicking on it to see my complete folder list. Because I use ClearContext filing functionality to move messages out of the Inbox, I only navigate to my folders when I’m looking for something, so hiding the list and opening up more space is a big plus. This is another time saver for me. Viewing pictures or Word Documents is a snap, appearing right in the Preview pane without launching another window. This feature is only marred by the fact that it doesn’t universally open all attachments (for example, PDF files) but instructions are available to create your own viewer if you’re so inclined. This is just a better way to slice up information in Outlook. 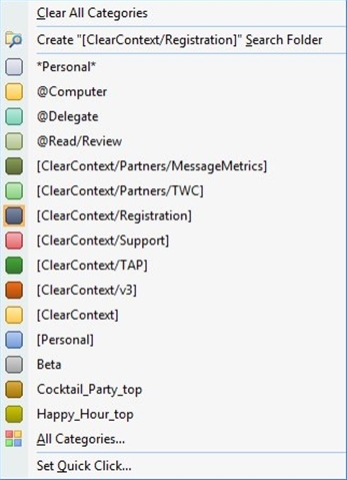 One of the reasons we built the ActionView into ClearContext is that previous versions of Outlook didn’t recognize that "to-do’s’" – appointments, tasks, and flagged items – are scattered across multiple silos, making it difficult to get an integrated picture of everything that’s on tap for the day. In Outlook 2007 tasks and flagged messages are displayed alongside appointments, making it much easier to see what I should be working on and when. This IMS Pro feature, integrated directly into every message – is only available on 2007 and shows all messages, tasks and appointments in the current conversation. This gives a very clear picture of all past communications regarding this subject and any actions that have been taken on it. I write this up as one of my five favorite features of Outlook 2007 because previous releases did not afford us the opportunity to automatically integrate this information right into the message itself. For this release, the Outlook team put a lot of work into providing more robust hooks into the application so that partners like ClearContext can build a seamless experience for their customers. 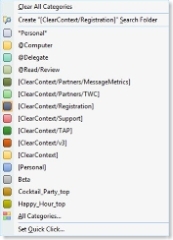 Look for even tighter integration from ClearContext and other add-in vendors as we continue to take advantage of the new API’s that Outlook 2007 provides. As I discussed earlier, I’m also a fan of the better exposure of categories in Outlook 2007. The bottom line here is that I find the changes made to Outlook for the new release provide significant productivity gains over previous versions of Outlook – it just fits better with the way that I work. If you like the Ribbon UI in the other apps (which, for what it’s worth, took me several weeks to get used to, but now I would not want to go back), then it’s definitely worth the upgrade. BONUS: See Deva’s thoughts on Outlook 2007 in his interview with OutlookPower magazine. Posted by brad at 9:10 am on January 29th, 2007. 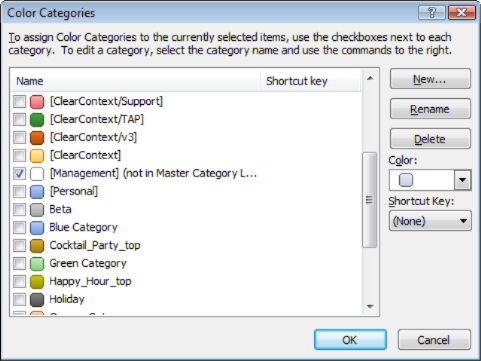 Yesterday I wrote about the new visibility of categories Outlook 2007 in Outlook 2007 emails. For IMS v3, we implemented the ability to synchronize IMS Topics to Outlook categories to take advantage of this new functionality. By default, in new IMS installations on Outlook 2007, ClearContext automatically enables this synchronization. You can switch this preference on/off and change the delimiters we use to ID a Topic via ClearContext > Options > Preferences > Topic Options. In the Inbox, Select a message with the Topic assigned that you intend to color-code. Right click the Quick Click category field in the Inbox View. Assign a color and click OK.
Click OK once more to clear the Color Categories dialog. Now, everytime a message is assigned this Topic, the newly assigned color will appear both in the Inbox view and on the information bar of the email. One of the new features in Outlook 2007 is the exposure of categories on email messages in a way that is very visible and useful. Whereas setting categories on messages in Outlook 2003 and earlier was a multi-step, hidden process; email categories are now king in the 2007 interface. They appear in the Outlook information bar, are color-coded in the message list view, and are easily assigned by right-clicking a message. By default, Outlook 2007 installs and enables a rule to eliminate incoming categories. If you don’t want Outlook to strip out incoming categories, rule “Clear categories on mail (recommended)” can be disabled via Tools > Rules and Alerts. This will enable Outlook 2007 users to see the category assignments made by POP users on Outlook 2003 or earlier (and I assume other non-Outlook email clients as well). Outlook 2007 strips out categories prior to sending, regardless of platform. I haven’t found a way to turn this off – please let me know if you find one. Exchange appears to strip categories in both the send and receive process – keeping categories local to your mail file. The net net here – if you’re using Outlook 2003 or earlier and accessing your email via POP, your email category assignment may be communicated to the outside world. For Exchange and Outlook 2007 users, however, Outlook is doing its best to try and keep that information from leaking out. For more information on categories and Outlook, see this SlipStick post. 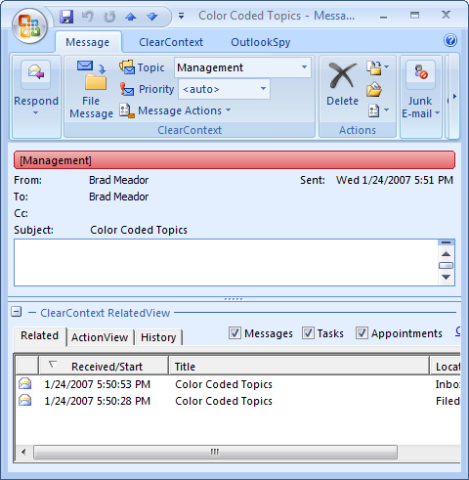 A little later I’ll post instructions for syncing ClearContext Topics to categories and using Outlook 2007 to color-code messages by Topic. Last week CEO Deva Hazarika went up to Redmond to participate in a two day workshop on the issue of infomania in the workplace – “the loss of concentration caused by constant electronic interuptions that plague many office workers.” Representatives from more than twenty companies and institutions (including Intel, Microsoft, IBM, Google, Morgan Stanley amd industry analysts and university researchers) spent two days talking about the problems faced by information overload and various strategies to fight the issue. For those of us who suffer from this problem, it’s good to know that folks are trying to do something about it. Read the article for more detail, including five quick tips for coping with e-mail and information overload. Posted by brad at 11:38 am on January 23rd, 2007. It seems that every time Gmail releases a new feature, the pundits start predicting the death of corporate hosted email systems. But the information transmitted and stored within email is the life blood of most organizations. The reality is that there are some severe security, privacy and retention issues that will need to be overcome before major corporations relinquish control of their corporate communications into the cloud. This issue also includes some great tips from Windows professionals for working more efficiently. It’s definitely worth a read. Posted by brad at 2:51 pm on January 2nd, 2007.